For all those other conversions, including homemades and one-offs. Your a saint, I dont want to waste the oak faced ply! 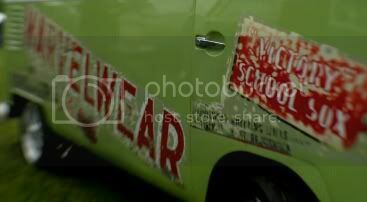 [img]http://i383.photobucket.com/albums/oo27 ... 902021.jpg[/img] 63 CKD Australian type2t1b School clothing bus from Melbourne called"Marvin"
This is very nice. I like the little details like the aluminium strips on top of the rear drawers. Hope to see it in the flesh one day. Only dead fish go with the flow! Totally agree with all Will.... Amazing work and certain things just finish it off and make it look that extra bit special! Very impressed and combined with the bus, puts your lovely previous ride into the photo album.... Bettered, but not forgotten. Will, the door in the side of your seat is a top idea! Like it loads. Do you remember what size foam you got as in density and thickness please? The other door allows me too put longer items, such as the windbreak, in against the bulkhead. Sooty wrote: Will, the door in the side of your seat is a top idea! Like it loads. 100% honest... You happy with 100mm? Sooty wrote: 100% honest... You happy with 100mm? Cool. If you've had it twice that's me sold. Other people have said 4" so that's me sold. Cheers Will. Sooty wrote: Cool. If you've had it twice that's me sold. Yeh.... I kinda guessed that.